That no-expense-spared Schmidt Eightvoice Analog Synthesizer was, without doubt, a showstopper when namesake hardware and software designer Stefan Schmidt’s hand-crafted first prototype unit debuted at Musikmesse 2011 in Frankfurt, Germany. Subsequently supported by e:m:c (electronic music components) — German distributor of several key electronic musical instrument brands (including Mellotron, Moog, and Vintage Vibe), Stefan Schmidt’s ‘one-off’ dream machine made it into production as a sound designer’s dream — albeit bravely built as a limited 25-unit batch of what was quite possibly the most expensive analogue eight-voice polyphonic synthesizer the world had yet seen and heard! 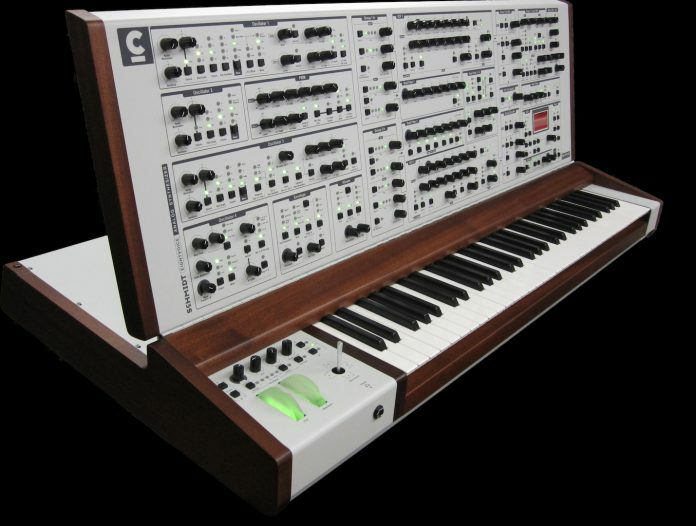 However, a cursory glance at its complex four-oscillator structure clearly convinced even the most skilled synthesists that the Schmidt Eightvoice Analog Synthesizer was capable of creating complex timbres that go way beyond the capabilities of conventional analogue synthesizers, so Schmidt-Synthesizer’s first batch (slowly) sold out… onwards and upwards, ultimately, a second 25-unit batch was billed as being the last.